An archives serves local patrons, but it also often connects to a national audience through its collections. Cline Library's materials about the Native American Code Talkers of World War II highlight how a local story reached international heights. Most Americans and many in the global community already know the story through high school history courses or Hollywood movies. Yet the archives fills in the forgotten and lesser known details, helping to preserve the names, memories, and bravery of local community members turned heroes. 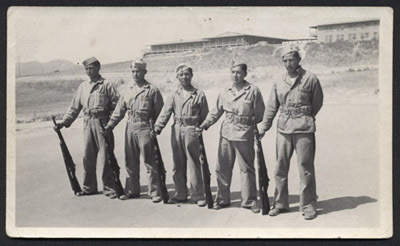 Navajo Code Talkers in formation at Camp Elliott, California. Most scholars credit Philip Johnston with initiating the Code Talker idea. A caucasian who grew up in Leupp, Arizona on the Navajo Reservation east of Flagstaff, he approached the Marine Corps in 1942 after the attack on Pearl Harbor and proposed using Native American languages for combat communications. 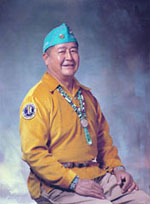 His familiarity with Navajo culture led him to bring four Navajo volunteers to Camp Elliott in San Diego, California for a demonstration. 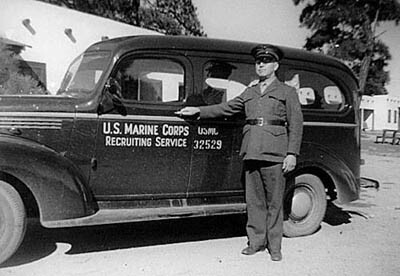 Impressed with successful and efficient English and Navajo translations, the Marine Corps began recruiting Navajos. The first group of twenty-nine recruits entered boot camp, took courses in military communication procedures, and developed the code. Technical Sergeant Philip Johnston on a recruiting tour of the Navajo Indian Reservation, October, 1942. The code required incredible command of both English and Navajo. Each letter of the alphabet and common names and words corresponded to English and Navajo code words. 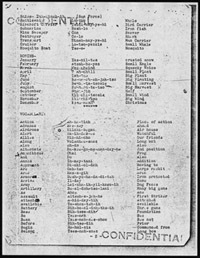 Frequently used letters received alternate code words, requiring Code Talkers to memorize hundreds of terms in both languages. 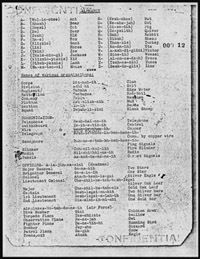 Click on the images to the left to explore more of the original code and the Navajo Dictionary. "We weren't informed as to if it was routine or priority or top secret, confidential, whatever the case may be. We were just given the message to deliver and that's our job. We didn't question it, if it was highly secret or high priority or anything of that nature." — John Benally, interview by Benis M. Frank, July 9-10, 1971, Oral History Transcript: Marine Corps Navajo Code Talkers (Washington, D.C.: Department of the Navy, History and Museums Division, 1976), 137-8. The Marine Corps deployed the Code Talkers to the Pacific, where the code proved effective and indecipherable. Yet aside from relaying communications, soldiers in the Code Talker program performed other valuable military duties in battles such as Iwo Jima and Okinawa. Oral histories at Cline Library highlight how Code Talkers were also scouts and infantrymen with similar experiences to others in the war, whether facing enemy fire or reveling in friendly comradery. "We were not only signalmen. We were riflemen, machine gunners, everything -- wherever we were needed, that's where we went." — Jimmy King, Sr., interview by Benis M. Frank, July 9-10, 1971, Oral History Transcript: Marine Corps Navajo Code Talkers (Washington, D.C.: Department of the Navy, History and Museums Division, 1976), 56. The Navajo reservation falls into the collection scope for the Cline Library Special Collections and Archives, affording the public the opportunity to explore and marvel at the nationally significant Code Talkers story through the Philip Johnston Collection and Navajo Code Talkers Collection. "Navajo Code Talkers," by Carl N. Gorman (reproduction of an acrylic sketch on paper). 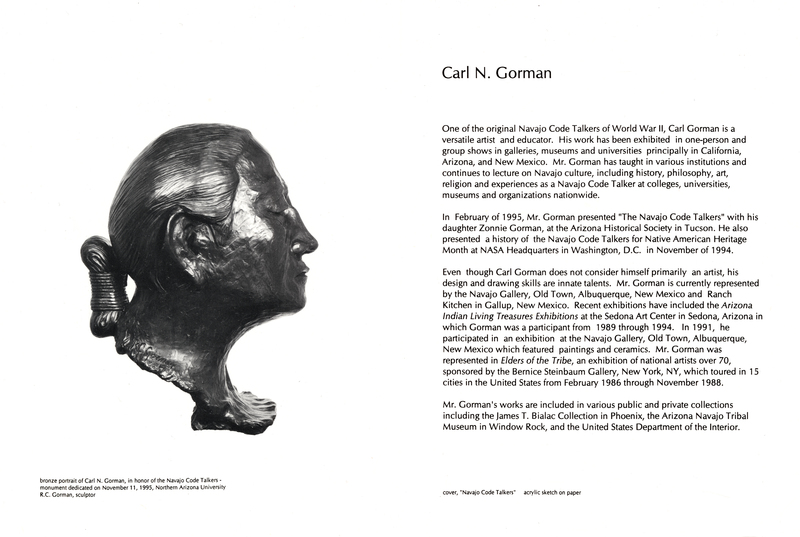 One of the original Navajo Code Talkers of World War II, Gorman was also a versatile artist and educator. He lectured on Navajo culture, history, and art throughout the nation, and his work appeared in museums and galleries primarily in Arizona, New Mexico, and California. 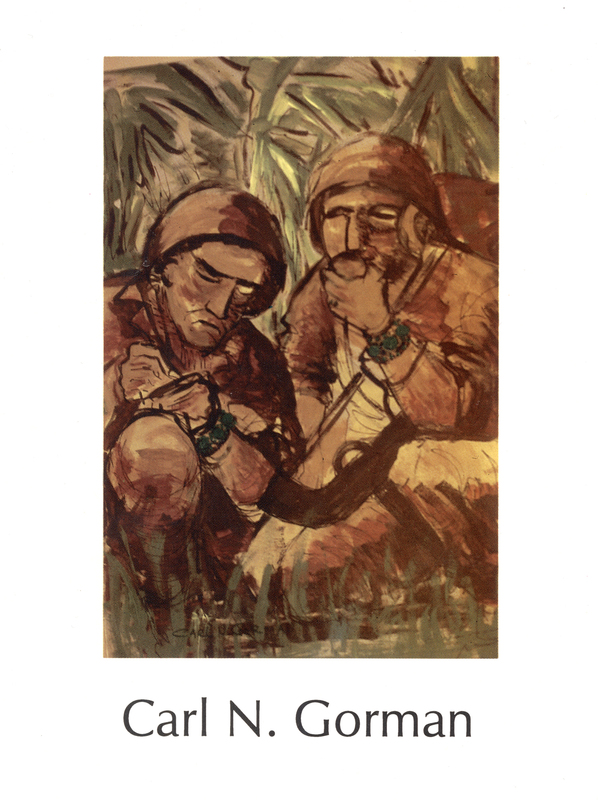 S. McClain, Navajo Weapon (Boulder: Books Beyond Borders, 1994), 21-36; Doris A. Paul, The Navajo Code Talkers (Pittsburgh: Dorrance Publishing, 1973), 6-12. "The Navajo way of sending these messages...was not a code. We could change it. We could keep it as long as we wanted. But you had to live with it from day to day, week to week, month to month, in order to make it as effective and as speedy and as secure as it was." — Jimmy King, Sr., interview by Benis M. Frank, July 9-10, 1971, Oral History Transcript: Marine Corps Navajo Code Talkers (Washington, D.C.: Department of the Navy, History and Museums Division, 1976), 46.